In a windowless room some 20 miles outside Chicago, five scientists in jeans and shirtsleeves are preparing to glimpse something that until now has been hidden from human view: the nearly instantaneous, atomic-level transformation of a material under intense pressure. Since the dawn of time, such changes have gone hand in hand with some of the most extreme of moments: the creation of the universe, the heat and pressure in the Earth’s core, the failures of bridges and buildings, and the business end of a bullet. Until now, no one has seen them in such detail. On this day at Argonne National Laboratory, Stefan Turneaure, a senior scientist in Washington State University’s Institute of Shock Physics, is subjecting a piece of quartz to about 30 gigaPascals. That’s more than 4 million pounds per square inch and enough to turn carbon into diamond. Working with a collaborator at Princeton University, he aims to tease out the structural changes of a meteor impact and if they happen during the impact’s compression or release. Dynamic Compression Sector at Argonne National Laboratory, Advanced Photon Source. Ten computer screens are arrayed before him, including the views from four cameras that will capture images of the impact only millionths of a second apart. Another screen shows a nearby lead-lined room just big enough to hold a high impact velocity launcher that will send a plastic .50 caliber bullet into the quartz sample. “Things will move fairly rapidly at this point,” says Paulo Rigg ’99 PhD, manager of the facility. Turneaure and the actual facility operator, Drew Rickerson ’15, start conversing in the deliberate, redundant code of a final sequence in which nanoseconds actually count. The gun, muffled by a door so massive it has to roll on overhead wheels, sounds like a mallet striking a large block of very dense wood. It belies the violence that has just taken place. The camera screens in front of Turneaure are now mottled with light, indicating that the sample has indeed been smashed. Hidden from view is a brief torrent of information that, once deciphered, will offer new clues into the heretofore unseen heart of the matter around us. Some of the most important moments in the career of physicist Yogendra Gupta ’72 PhD can be measured in millionths of a second. For decades now, he has smashed materials in a field called shock physics, the study of how condensed matter responds to intense, immediate pressures and temperatures. “If it’s not a very high pressure, it’s not a very high temperature, it’s not a very short time scale, I’m not interested,” he says. For years, he operated out of the basement of the Physical Sciences Building on WSU’s Pullman campus, firing projectiles into samples backed by piles of rags and a 700-pound steel plate. The impact could turn eight feet of rags into a six-inch wad of felt. The work is consistently sponsored by the U.S. Department of Energy and the Department of Defense, making Gupta one of the most highly funded WSU researchers. In 2003, the Institute for Shock Physics, which he directs, moved into a 33,000-square-foot building that is the first at WSU dedicated solely to research. Four years later, in his eternal quest for shorter time frames and greater insight, he started talking with the Department of Energy about establishing a facility at the Argonne National Laboratory and its stadium-sized Advanced Photon Source. 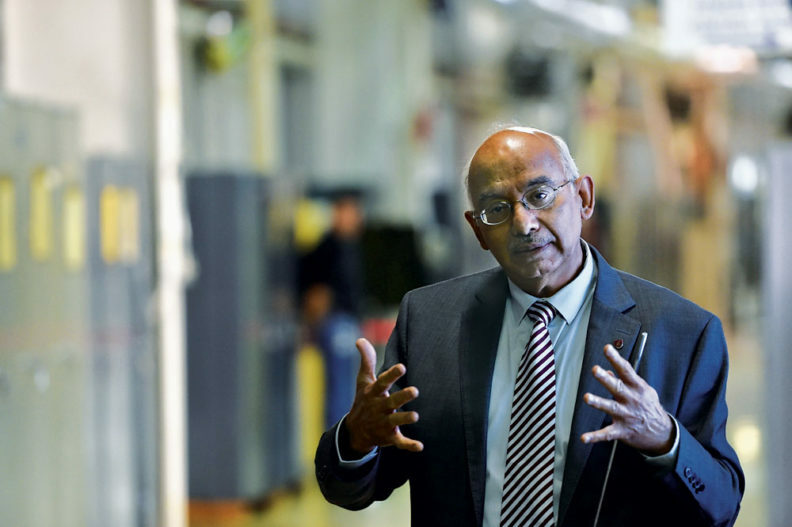 Gupta was interested in the Advanced Photon Source synchrotron, a two-thirds-mile diameter ring that produces brilliant x-ray beams by hurtling electrons at nearly the speed of light and deflecting them with magnets. The beams are then corralled into laboratories, called “sectors,” that work out of sawtooth-shaped offices arrayed on the edge of the ring. A timeline on display in the Advanced Photon Source describes 20 Nobels awarded to x-ray researchers since Wilhelm Röntgen’s 1901 award. Two prizes, in 2009 and 2012, stem from work on the Argonne beams. That’s in part because the x-ray can do so much more than pass through materials or image things like broken bones and dental caries. Tuned to the right frequency, they can characterize the atomic structure of materials a scientist wants to analyze: photoactive materials in solar cells, lightweight alloys, viral proteins, plant hormones, even something as quotidian as the dulling razor blade. 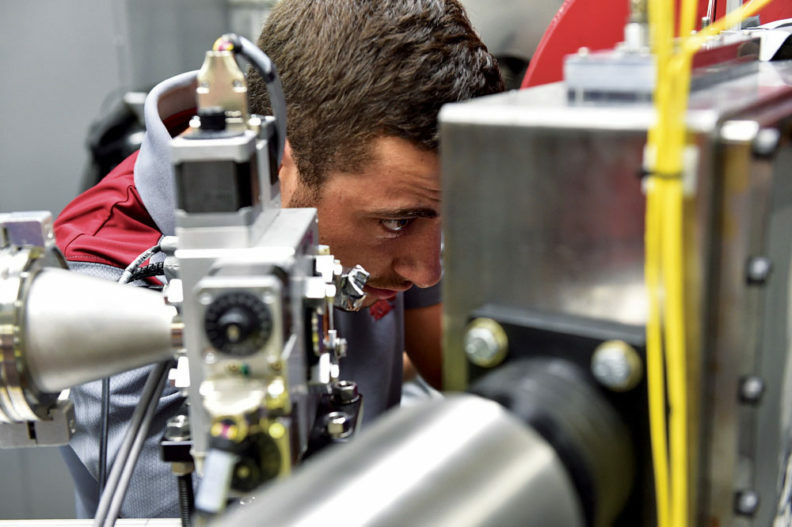 The research, while largely basic science, could inform work to develop stronger car bumpers, lighter body armor for soldiers, and lighter, stronger alloys. The sector is actually four labs, or hutches. In one hutch, a gun fires a projectile at up at 2.5 kilometers per second—more than 5,500 miles per hour. In the second, a gun combines a gunpowder load and pressurized gas to reach more than twice that speed. The third hutch holds a laser that uses the momentum of photons to shock materials. The fourth hutch is for experiments using specialized experimental platforms. 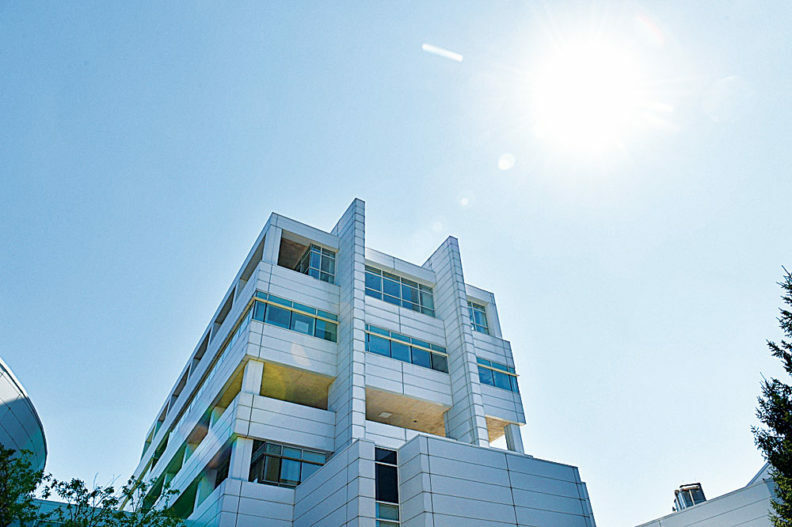 Even before the sector’s opening ceremony, which included accolades for coming in ahead of time and under budget, the facility was already seeing results. Earlier this year, a team from Lawrence Livermore and Los Alamos national laboratories measured for the first time the effect of shock waves on additively manufactured, or 3D printed, materials. The experiments studied lattice structures in the material, including how they bent, stretched, and deflected under pressure. The finding is a clear step towards fulfilling additive manufacturing’s promise to engineer a more ordered structure into otherwise randomly porous materials. “This will open up the possibility of designing and engineering material properties to precisely meet the demands of the intended application,” wrote the researchers, led by WSU Associate Professor James Hawreliak, in Scientific Reports. Another experiment led by Turneaure provided an extremely elegant demonstration of what the facility can do. It involved silicon, “the lifeblood of all modern society,” notes Gupta. Using the more powerful two-stage gun, the researchers subjected a piece of silicon to the impact of a plastic projectile moving nearly 12,000 mph. While the photon source x-rays hit the sample in pulses, a detector captured images of the diffracted rays every 153.4 nanoseconds—the equivalent of a camera shutter speed of a few millionths of a second. The resulting images were an echo of Eadweard Muybridge’s three-second silent film of a galloping horse, but much smaller and faster. The “movie,” in this case, captured a phase change, like the more common transformation from solid to liquid, or liquid to gas. But here the material makes a relatively inscrutable transition from solid to solid. Computational physicists have tried their hand at the question, but the process is so complicated that it challenges the most powerful computers. Even when they do develop a model, it’s just a model. That’s because the researchers captured the exact moment that their silicon sample transformed from its common cubic diamond structure to a simple hexagonal structure. Their observations were so precise that they could see both structures as the shock wave traveled through the sample. The critical, revelatory moment took less than half a millionth of a second.